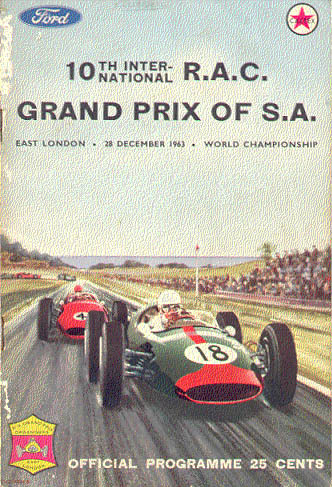 The 1963 South African Grand Prix, formally titled the 10th International RAC Grand Prix of South Africa, was a Formula One motor race held at East London on 28 December 1963. It was the tenth and final race in both the 1963 World Championship of Drivers and the 1963 International Cup for Formula One Manufacturers. The 85-lap race was won from pole position by Jim Clark in a works Lotus-Climax, the Scottish driver achieving his seventh win of the 1963 Championship. Dan Gurney finished second in a Brabham-Climax, while Graham Hill was third in a BRM. Notes: Only the top five positions are included for both sets of standings. Only the best 6 results counted towards the Championship. Numbers without parentheses are Championship points; numbers in parentheses are total points scored. ^ "Motor Racing Programme Covers: 1963". The Programme Covers Project. Retrieved 10 July 2017. ^ "1963 South African Grand Prix". formula1.com. Archived from the original on 6 October 2013. Retrieved 20 September 2015. ^ a b "South Africa 1963 - Championship • STATS F1". www.statsf1.com. Retrieved 20 March 2019.